Justice John McMahon said McArthur’s guilty plea and his age at which he could apply for parole were mitigating factors in the sentence: “The accused has saved the family, friends and community at large from enduring a graphic public trial that would have been a nightmare for everyone,” McMahon said, according to CTV. After the sentencing, Nicole Borthwick, who knew some of the victims, said outside court that the judge was too lenient: “It’s not enough for the families or for the lives lost,” she told reporters. McArthur was arrested in January 2018 and charged with the murder of two men who went missing in 2017: Since then, police have investigated locations around Toronto where McArthur worked as a landscaper. The investigation led to the additional murder charges. Crown attorney Michael Cantlon, in a statement, called the case ” a crime of stark horror.” CTV reported: “Although there can be no closure from a crime of this magnitude, we hope that these eight convictions for first degree murder will assist our community in beginning a new chapter of healing,” he said after the sentencing. When Toronto police picked up McArthur, they found a man tied to his bed. A search of the suspect’s hard drive for evidence revealed eight folders labeled with the names of different men: Each folder contained photos of the men — some alive, some dead and some with their naked bodies posed in fur coats or with unlit cigars. A ninth folder was labeled with the name of the man tied to the bed: Cantlon made the details public this week by as part of the sentencing of McArthur, who lured the men to his home, strangled them and dismembered them, according to CTV News. He buried their remains in garden planters and in a ravine, Cantlon said. 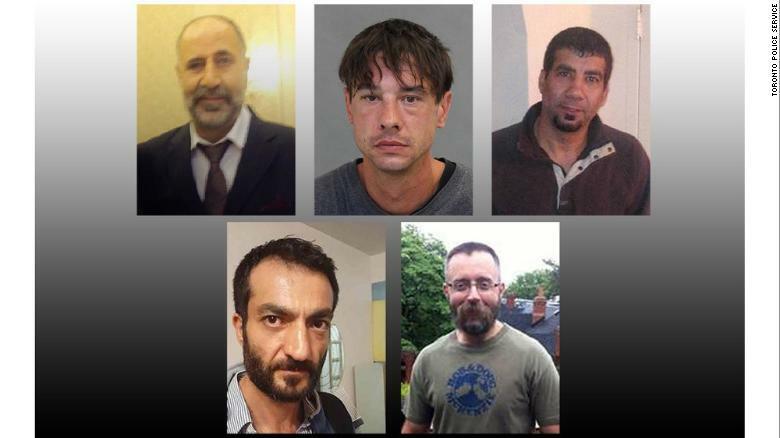 Many of the victims, although not all, were from the Gay Village, a neighborhood in Toronto known for its predominantly gay population: McArthur had some sort of relationship — some of which were sexual — with each of his victims, Toronto Police spokeswoman Meaghan Gray said last year. Most of the victims were immigrants of South Asian or Middle Eastern descent, Cantlon told the court: The Crown believes that McArthur killed his first victim, Navaratnam, in September 2010. After his final victim, Andrew Kinsman, went missing in June 2017, law enforcement began investigating McArthur. Investigators found a calendar inside Kinsman’s apartment with the name “Bruce” written on June 26, 2017, the day Kinsman went missing, according to CTV: Surveillance footage from Kinsman’s neighbourhood showed him entering a red Dodge Caravan identified as belonging to McArthur. Inside the vehicle, which was later discovered in a scrapyard, investigators found DNA that matched Kinsman and Esen. The photos on McArthur’s computer — some of which were taken when the men were alive — showed that the victims were “restrained and sexually assaulted,” Cantlon said: Some photos showed the murder weapon — a metal bar with a rope that McArthur used to strangle his victims — around victims’ necks, Cantlon said………….In addition to the photos, police found the victims’ jewelry in McArthur’s home, Cantlon said. A duffel bag in the apartment contained duct tape, a surgical glove, rope, zip ties, a black bungee cord, and syringes, according to CTV. Faizi was reported missing on December 29, 2010, Kayhan was reported missing in October 2012, and Mahmudi was reported missing in August 2015: Kanagaratnam moved from Sri Lanka to Canada in 2010. He was not reported missing. Police said he was likely killed sometime between September and December 2015…………….Esen, who had no fixed address, was reported missing in April 2017………….Lisowick was not reported missing, but authorities believe he was killed sometime between May 2016 and July 2017. The court this week heard victim impact statements from those who knew Esen and others, CTV reported: “Our lives were shattered with the shocking news. We can’t come to terms with his savage murder,” sister Nadia Wali said in a statement on behalf of the Esen family. A Crown attorney read aloud a statement from a daughter who never met Lisowick: “I will now always have to live with knowing I will never have a relationship with my father,” Emily Bourgeois said. The Rev. Deana Dudley of the Metropolitan Community Church of Toronto said in court that McArthur’s arrest would have a “deep and lasting” impact on the LGBTQ community, according to CTV: “Many in our community have lost their sense of safety. … There is a sense of ‘it could have been me, it could have been any of us,'” Dudley said.